Poverty is a major obstacle for the enjoyment of human rights. People who live in poverty are not only deprived from their right to an adequate standard of living, but they are also prone to other human rights deprivations such as lack of access to education or healthcare services. Furthermore, in addition to deprivations of the socio-economic dimension of human rights, poor people are also prone to exclusion from political participation processes or denial of access to justice, making them more vulnerable to be victims of violence, arbitrary law enforcement, torture and other violations of the civil and political dimension of human rights. Therefore, with regard to targets, targets 1.1 to 1.5 are equally important to be achieved by all countries, especially countries that are still struggling with high number of population living in or below the poverty line. With almost half of the population living in vulnerable economy, it is important for Indonesia to eradicate poverty as both of its development and human rights agendas to ensure the fulfillment of the right to an adequate standard of living for all Indonesians. Badan Pusat Statistik, Garis Kemiskinan Menurut Provinsi, 2013 – 2015, available at: https://www.bps.go.id/linkTableDinamis/view/id/1120. Four out of the seven existing global targets on ending poverty are considered by the Government of Indonesia (GoI) to be in line with its National Mid-term Development Plan (RPJMN) of 2015-2019. The corresponding targets have been incorporated in the GoI’s National Implementation Plan of SDGs. Table I.a. List of global and national SDGs targets. 1.2. 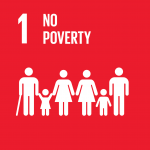 By 2030, reduce at least by half the proportion of men, women and children of all ages living in poverty in all its dimensions according to national definitions. 1. Decreased poverty level. a. Decreased poverty level, from 9.5-10% in 2015, to 7-8% by 2019. 3. Increased number of membership in the National Security System Programs. a. Increased enrollment percentage of the National Health Insurance program (Kartu Indonesia Sehat), from 60% in 2015, to 95% in 2019.
b. Increased percentage of poor and vulnerable elderly people to receive basic necessity assistances, from 2.24% in 2015, to 2.28% in 2019.
c. Increased percentage of poor and vulnerable disabled people to receive basic necessity assistances, from 14.48% in 2015, to 17.12% in 2019.
d. Decreased number of poor households to receive conditional cash transfer, from three million households in 2015, to 2.8 million households in 2019.
e. Increased enrollment number of the National Social Security System (SJSN) for Employment, from 29.5 million of formal employees and 1.3 million of informal employees in 2015, to 62.4 million and 3.5 million in 2019.
f. Increased number of low-income households to access adequate housing to 18.6 households in 2019. 5. Availability of national and local strategies for disaster risk reduction. a. Increased the location number of strengthened disaster risk reduction areas, from 35 areas in 2015, to 39 areas in 2019.
d. Increased number of natural/social disaster affected areas to receive special services education, from 100 in 2015, to 450 in 2019. 2. Increased expenditures for primary services (education, healthcare and social protection) a. Budget allocations for poverty alleviation programs in various sectors. e. Implementation of the Minister of Finance Decree on gender responsive planning and budgeting. To combat poverty and to fulfill the right of the people to obtain an adequate standard of living is not only a developmental programmatic aspiration but, most importantly, a human right obligation of every State towards its citizens, especially for the State parties to the International Covenant of Economic, Social and Cultural Rights (ICESCR), such as Indonesia. In addition to the obligations set forth under Article 11 of the ICESCR to respect, protect and fulfill the right to an adequate standard of living for the persons and their families, GoI is also bound by the 1945 Constitution, particularly Article 28C paragraph (1), stating that “Every person shall have the right to develop him/herself through the fulfillment of his/her basic needs…”. From a human rights perspective, poverty represents the lack of ability of a person to fulfill her basic capabilities. Therefore, it is important to measure the minimum requirement for people to acquire their basic needs as a condition to define poverty line at the national level. The Indonesian Statistic Agency (BPS) provides measurements on both the National poverty threshold (GK) and the minimum cost of living. However, there is still a wide gap between the two measurements. While the National minimum cost of living is set at IDR. 1.123.744/month (± USD 2.9/day), the poverty threshold is set at IDR. 333.034/month (± USD 0.85/day). That being said, for those who live on the National poverty line are principally living in extreme poverty, as they are almost three times below the National standard to acquire their basic capabilities. Moreover, those who live on less than USD 2/day are also living in extreme deprivation of adequate achievement of those basic capabilities. To this end, in order for the GoI to create an impactful outcome in its effort to eradicate poverty in Indonesia, it should use the minimum cost of living as a measurement to define poverty line and identify poor population in the national development target. Indonesia runs its social security system through various ministries and agencies, such as the National Health Insurance Agency (BPJS Kesehatan) and the National Social Security Agency for Employment (BPJS Ketenagakerjaan), the Ministry of Social Affairs, the Ministry of Religious Affairs and many others. The unavailability of a single window service in managing the social protection system has created issues of coordination and overlapping programs. According to Bappenas, in addition to lack of coordination, the social protection system is also facing other challenges such as not reaching the intended target group appropriately, insufficient budget and lack of optimal programmatic accompaniment mechanism. The UNPDF also identifies that the current social protection schemes are narrowly targeted, conditional, low value, very expensive to administer, and have no positive impact on reducing poverty or child poverty rates. The value of some cash transfer programs, for instance the Program Keluarga Harapan (PKH), a conditional cash transfer program for very poor families, it only provides cash assistance of maximum IDR. 3.700.000 annually, less than 30% of the national minimum cost of living. Adopt policies and implement programs to provide unemployment benefit to prevent unemployed persons from extreme deprivation of their basic needs. Committee on Economic, Social and Cultural Rights, Concluding Observations on the initial report of Indonesia, E/C.12/IDN/CO/1, 2014, paragraph: 21 (c). Available at: http://tbinternet.ohchr.org/_layouts/TreatyBodyExternal/Countries.aspx?CountryCode=IDN&Lang=EN. Access to basic services, such as electricity, proper sanitation, clean and drinkable water, adequate health and education facilities are fundamental for every household to be able to function well. Access to these basic services are related to various human rights guarantees enshrined in the ICESCR, particularly with regard to the right to an adequate standard of living (Article 11), the right to the enjoyment of the highest attainable standard of physical and mental health (Article 12), and the right to education (Article 13). The right to basic services are also enshrined in the 1945 Constitution of the Republic Indonesia, particularly in Article 28H paragraph (1) “Every person shall have the right to live in physical and spiritual prosperity, to have a home and to enjoy a good and healthy environment, and shall have the right to obtain medical care.” as well as all the constitutional guarantees regarding the right to education provided for in Article 31. As of 2015, the majority of households in Indonesia (97.5%) have access to electricity in their homes, however, there are still 39% of households are without access to adequate source of water and 38% of households are without access to adequate sanitation, contributing to 22% of the population practicing open defecation. Furthermore, there are only 34,857 public community health centers (Puskesmas)/supporting health centers (Pustu) serving 81.626 sub-district/villages across Indonesia, which means that there are still 57% of sub-districts/villages without access to the most moderate health facility. As for land tenure, despite the fact that 83% of households own their own home, there are still 40% of uncertified lands in Indonesia due to the complicated land adjudication process and 69% of the land is owned by approximately 16% of the population. Moreover, limited information on zoning plans and regulations have also created difficulties in registration process and increasing the risks of evictions. Therefore, security of land tenure is also a very important factor, especially for the poor, since land does not only provide shelter, but also a source of livelihood for them. Increase the number of households with access to adequate sanitation. See, UN Special Rapporteur on Adequate Housing, paragraph 42. See, UN Special Rapporteur on Adequate Housing, paragraph 46. Women/children, people with disabilities, and indigenous peoples are vulnerable to a severer conditions of poverty. Recent studies indicate that people with disabilities in Indonesia are 30 to 50 per cent more likely to be poor and without employment than those without disabilities. Therefore, in terms of social protection provision, it is important to secure basic income for poor unemployed people with disability to fully enable them to fulfill their basic needs. The current scheme to support basic income for people with disability deemed insufficient, as it only covers less than 30% of the monthly minimum living cost set nationally. Basic services must also be arranged in a way that people with disability can access them just like other people without disability and in accordance with the right of people with disability to an adequate standard of living and social protection provided for in Article 28 of the Convention on the Rights of Persons with Disabilities, to which Indonesia is a party. Moreover, the Program Keluarga Harapan (PKH), a conditional cash transfer program, may deprive poor women living in remote areas without access to health facilities due to its strict conditions requiring women to conduct a rigid number of medical examination during and after pregnancy. With regard to land ownership, although joint ownership for property purchased during marriage is recognized by the law, however the number of joint registered of land are still very low. In Java, In Java, for instance, there are only 5% of registered land in the names of husband and wife, while 65% of new titles are issued in the names of men and 30% in the names of women, due to lack of information and awareness of both the public and registration officers about the option of joint registration. Therefore, information with regard to the option of joint registration must be thoroughly disseminated and training among land registration officers about the issue should also be conducted regularly in order to strengthen land ownership for women. Indigenous peoples are among vulnerable groups facing tenure insecurity. Despite the legal recognition of customary land (tanah ulayat), collective ownership of land cannot be registered, deterring indigenous communities from applying collectively for land certificates. As a result, 33,000 indigenous villages, with approximate population of 48 million people, located within or around forest estates, are labeled as illegal or squatters and prone to forced eviction. Therefore, it is important for the GoI to ensure that land policy are also directed towards the protection of land security of indigenous communities occupying land based on customary law. See, UN Special Rapporteur on Adequate Housing, paragraph 66. See, UN Special Rapporteur on Adequate Housing, paragraph 48-49. In light of the above gap analyses, we propose the following additional indicators to strengthen the impacts of poverty alleviation as well as the human rights respect, protection and fulfillment at the national level. 1.2. Poverty level. a. Decreased poverty level, from 9.5-10% in 2015, to 7-8% by 2019. – The availability of an adequate definition of the poor, referring to those who live on less than the latest national minimum cost of living in every regulations and/or other policies on poverty alleviation interventions. – Proportion of people living below national benchmark of minimum basic cost of living (angka kebutuhan hidup minimum/bulan). 1.3 Access to social protection. a. Increased enrollment percentage of the National Health Insurance program (Kartu Indonesia Sehat), from 60% in 2015, to 95% in 2019. – The availability of a single window services for social protection programs to facilitate people to access a comprehensive social protection system, as well as to improve coordination and prevent overlaps among programs. – The availability of a more applicable conditions for conditional cash transfers for women living in remote areas without access to health facilities. a. Increased enrollment number of the National Social Security System (SJSN) for Employment, from 29.5 million of formal employees and 1.3 million of informal employees in 2015, to 62.4 million and 3.5 million in 2019. – The availability of regulations and/or other policies on unemployment benefit to prevent unemployed persons from extreme deprivation of their basic needs. – Proportion of households without access to adequate housing. The UN Country system in Indonesia is committed to play a strong role to assist the GoI to achieve SDGs with three main modalities namely policy advocacy and advisory, capacity building and knowledge sharing. With regard to poverty reduction, the UNDP, for instance, is part of the UN system in Indonesia that has been a long-term partner of the GoI to address poverty issues, the GoI will benefit a lot from various assistances provide by UNDP to strengthen the capacity to implement the national poverty reduction strategies. Moreover, with regard to targets on social protection, the GoI will also benefit from close partnership with ILO to strengthen the national social protection floor system.